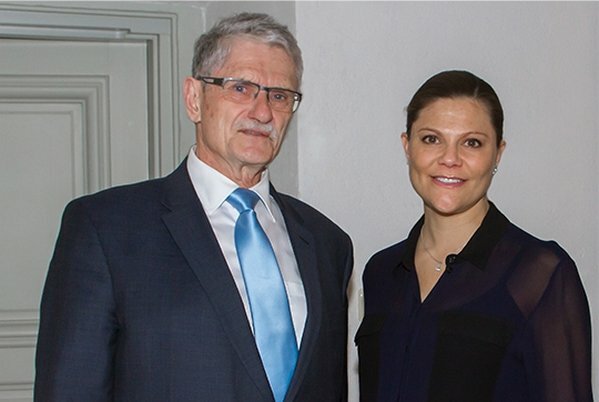 On February 15, 2016, Crown Princess Victoria of Sweden met with Mogens Lykketoft, the president of United Nations General Assembly at Stockholm Royal Palace. The meeting was held in order to discuss the ideas about Sustainable Development Goals Agenda 2030. Crown Princess Victoria is one of 16 delegates of Advocacy Group of Sustainable Development Goals - Agenda 2030 and the mission of that group is to promote the UN goals for international sustainable development. Wish her all the very best. CP Victoria is looking natural and beautiful. From what I can see it looks more like evening wear than daytime. I hope all goes well with her delivery. It will be exciting to have a new baby in the Royal Family. I bet Estelle is beyond excited! All the best to you Royal Highness!